For such a short month, February has so much to do! 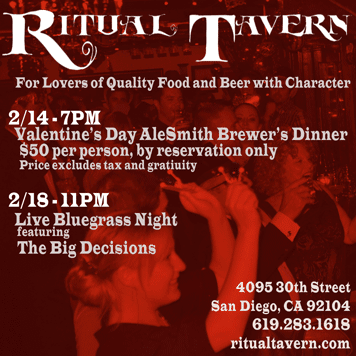 The Ritual Tavern is here to help you with your Big Decisions & Valentine's Day planning. Don't worry f you can't make it out on a school night, Ritual will be tapping a cask of AleSmith's 'My Bloody Valentine' on Friday February 10th. It's no secret that Ritual Tavern Loves Suzie's Farm. So we've decided to bring a little of the farm experience to North Park. If you've been to one of their 'picking & grinning' events, you're already a fan of the Big Decisions. Good time, old fashioned, feel good Bluegrass music performed live on Saturday night February 18th.